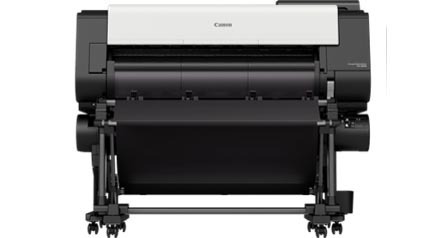 The Canon TX-3000 Printer is a 36″ wide-format printer, that features an all-new 5-color TD pigment ink set, delivering fabulously fine lines and sharp text. The Canon IPF TX-3000 Printer’s newly designed print head lays down the ink quickly and precisely. Benefit from advanced security features, such as Encrypted Hard Drive and iPSec Support on the Canon imagePROGRAF TX 3000 Wide Format Printer. All-new 5-color TD pigment ink set to produce fine lines and sharp text. Print onto water resistant media and your print will withstand outdoor conditions. Optional Multifunction Roll System enabling loading of a second roll of media onto the printer or s a bi-directional media Take-up unit to rewind longer printouts. Essential security features including Encrypted Hard Drive, iPSec Support, SSL/TLS and 802.1x Authentication. Buy High Capcity Ink Tanks based on your print volume. The Sub-Ink Tank System ensures no ink is wasted, and also allows for ink to be replaced without interrupting your print job. The newly designed Print Head is a 1.07-inch, 6-channel print head with 15,360 nozzles. Automatic Media Handling – Once the roll is placed the on the roll holder, the printer feeds an adjusts the media into optimal printing position. The TX Stacker can stack up to 100 sheets of ARCH C, ARCH D, or ARCH E/E1 page sizes.